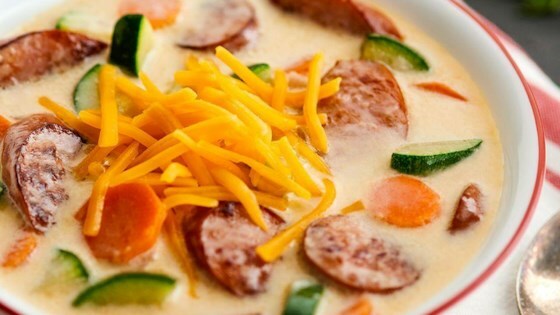 "Sausage, zucchini, carrots and onions in a creamy, cheesy broth make a soothing, hearty dinner on a chilly night." Heat oil in a large skillet non-stick skillet over medium high heat until hot. Add sausage, cook and stir until browned. Remove sausage from skillet and keep warm. Add onions and garlic and cook until onions are tender. Stir in zucchini and carrots to the skillet and cook, stirring occasionally, until the carrots are crisp tender; set aside. Melt butter in a large saucepan. Whisk in flour until it forms a paste. Add the broth, a little at a time, whisking after each addition until the mixture is smooth. Add the remaining broth and bring to a boil. Reduce to a simmer and stir in the evaporated milk and 1 cup cheese. Continue cooking, stirring continuously, until the cheese has melted. Stir in the reserved sausage and vegetable mixture. Top with remaining 1/2 cup cheese before serving. Spice up your mid week meal with spicy serrano burgers! Add 1 head of chopped cabbage; or, add 2 bunches of Swiss chard or torn spinach into the soup when you stir the cheese into the soup.